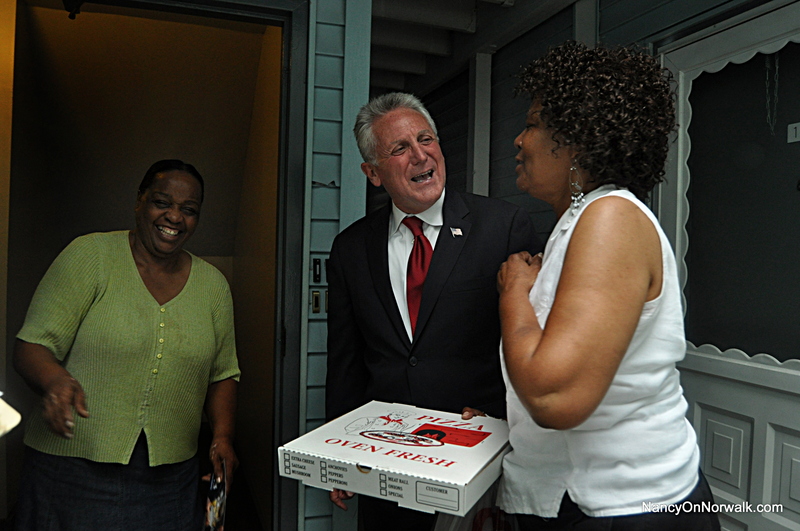 Beatrice Croswell, left, laughs along with former Norwalk Police Chief Harry Rilling and ardent supporter Georgiana Scott Monday in South Norwalk. NORWALK, Conn. – Harry Rilling’s years wearing a Norwalk Police uniform appeared to serve him well Monday evening as he walked about South Norwalk, looking for votes in his drive to be mayor. Four people spontaneously greeted the former police chief warmly as he ventured into Columbus Court Condos with retired Norwalk community policing officer Carleton Giles to look for registered Democrats in an effort to get votes in the Sept. 10 primary. Another woman spotted Rilling as she was bringing pizza to her grandson, and ran around the side of a building to see him and encourage others to vote for him. 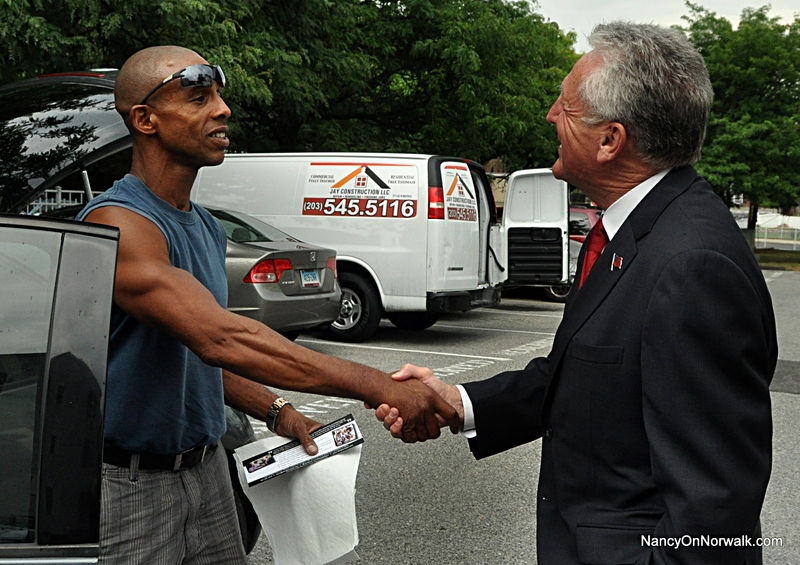 Rilling first knocked on doors nearby on Chestnut Street, without much success. Finding no one at home, he left fliers on doors. He was treated as a returning best friend in the condo complex, at the corner of Henry and Chestnut streets. 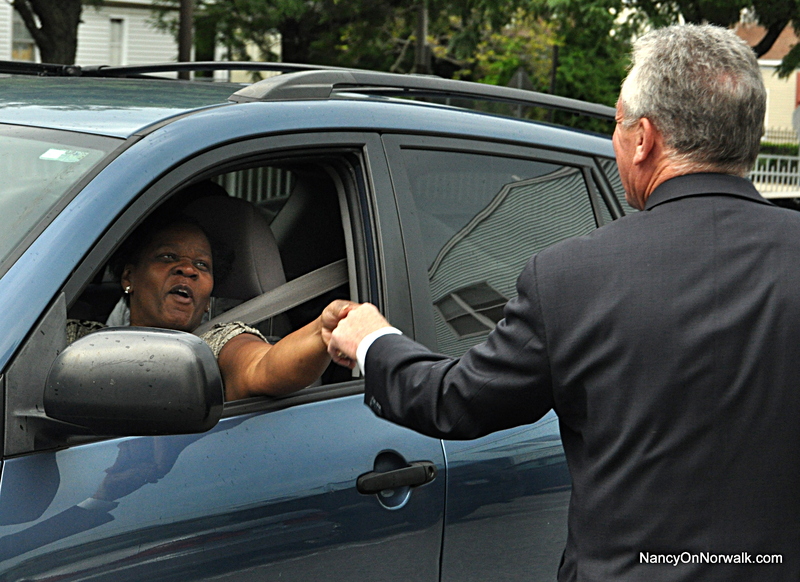 Former Norwalk Police Chief Harry Rilling is greeted Monday in Columbus Court. “I’m sure you can,” the man said. “There you go,” she said. Another woman called out from a porch, referring to Rilling’s suit. “Sharp! Sharp!” she said. A man wearing a Department of Public Works shirt turned the tables, asking if the candidate supported him. Rilling said he did. Not so familiar with Rilling was Beatrice Croswell, who spoke to him from her third story porch. “Who you going to vote for?” he asked. “I have no idea,” she said, causing laughter. “Seriously,” she said. She recognized Giles, though, and decided to descend the staircase to greet the men. The candidate was telling her the usual stuff – primary Sept. 10, etc. – when Georgiana Scott appeared, pizza in hand. She had volunteered for him and wanted to do more. On the spot, she encouraged Croswell and another resident to vote for Rilling. Rilling said he enjoyed that. Scott said she hadn’t always been nice to Rilling. Giles and Rilling moved on to another doorway, where Victor Saec was less supportive. “We might do it,” he said, when asked if he would vote for Rilling. After the chief left, Saec said he never knows who he will vote for before he gets in the voting booth, but he was “99.99 percent sure” it would be Rilling. The chief, meanwhile, was dashing off to join a bike ride with other candidates, having thought to wear cyclist attire under his business suit. At the beach after that event, another South Norwalk resident vowed support. Dede Farnworth, a Shorefront Park resident who is upset about shootings nearby, said she has never been involved in politics before. She’s in it now because of Rilling, she said. She is from Greenwich, she said. Her husband is from Puerto Rico; newly energized by a campaign, they plan to go to the mayoral forum Tuesday night at the South Norwalk Community Center to see what they all have to say, she said. But at this point she’s solidly behind Rilling. Really? Gang violence escalated under his watch!!! The clear choice – A Mayor for all the people. Gangs, guns, and violence have been around a long time. Before Harry became chief, the city pretty much was in denial and never admitted gangs were involved. When Harry became chief, the police, at least, stopped denying that gangs were a problem, and special programs to deal with gangs were started. Results were mixed, but a lot of progress was made. It seems you are attempting to re-write history. It was under Rilling’s time as police consultant that gangs, guns, and violence escalated. Also it was Rilling and Moccia that were and still are in denial of gangs, guns, and violence in Norwalk . Lets be honest if that were not the case the situation would not have gotten out of control as it has. Also Rilling was the king of excuses why the NPD had failed and failed miserably to prevent or solve crime. Rilling was the wrong person as police consultant and would be the wrong person as mayor. We don’t need denial and excuses. What we need is a person that is action orientated and Rilling has proven not to be that person. There you go again Tim T. Nothing but innuendo and nothing factual at all. You obviously have it in for NPD … People reading your comments are not fools, they truly understand your motives. this article says “Rilling gets warm reception in South Norwalk.” If he and NPD were such failures, why did people welcome him so warmly? First let me say your blind support for Rilling is commendable. However you are factually incorrect about Rillings performance as police chief. I along with many in Norwalk were glad to see him leave. We had hoped that would be the last we would see of Rilling in city government however like a wart he keeps coming back. Also as far as the headline about warm reception, its just that a headline to an article and far far from what the community feels about Rilling. Check the historical articles. You will see that the public conversion to acknowledging gangs in Norwalk preceded a grant for federal money for a gang fighting task force. Seems you can’t get those fed dollars or play with the FBI while you are denying gangs in Norwalk. Thanks don’t panic for pointing this out. You can attack the messenger all you want yet you have failed to give any reason why anyone should vote for Rilling. I have stated the reasons why one should not many times such as out of control crime, low apprehension rate, out of control overtime, officer of the NPD getting arrested, officer of the NPD violating major department polices, denial of gang violence , one excuse after the next for failure of the NPD to prevent or solve crime on Rillings time as police consultant. These issue all reflect poor leadership and poor management. Please tell us some of the positives that occurred under Rilling time as police consultant.